Could You Survive on WIC and Food Stamps? Home » Personal Finance » Could You Survive on WIC and Food Stamps? With these tough economic times, many people are turning to food assistance from the government. Programs designed to help you pay for food are available. Yet such programs are not meant to completely pay for many families’ food needs. For the most part, such programs are meant to be supplemental. Depending on your situation, it might be possible to survive on food assistance alone. WIC is meant to help children up to the age of five get the nutrition they need, as well as help women who are pregnant, breastfeeding, or postpartum. Food selection is limited with WIC; you can only use the special checks for certain items like infant formula, dairy, eggs, juice and some cereals. You need to check with your state to find out what items are included. Food stamps (actually EBT cards in most states) are also administered through the state. However, most foods are eligible for coverage. You can’t get foods that are already prepared (such as restaurant foods, or hot, ready made meals). However, there are no nutritional restrictions placed on the foods you get, like there are with WIC. If you have a child under the age of five, you could be eligible for food stamps and WIC. Combining these programs could provide you with the assistance you need to completely cover your food needs and costs for the month — assuming you are eligible. 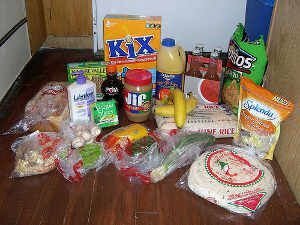 How Much Food Can You Get with WIC and Food Stamps? The amounts available to you vary by state, and by your own situation. With WIC, funds can run out. Many families with newborns focus mainly on the infant formula; once a child is a certain age, though, coupons for infant formula are no longer given and the monthly allowance ends up being cut roughly in half. With food stamps, you can get an idea of what you might qualify for in your state by using the pre-screening tool offered by the FDA. For this article, I put in information for a four-person family living in Utah, with $800 in checking/savings, and an annual income of $25,000 a year. Your current assets, income, and mortgage payment (I entered $950) are all considered. The result was that I could expect $346 a month in benefits. Combined with WIC for one child under the age of five, the total would be close to $400 per month. With careful planning, it should be possible to feed a family of four on $400 a month. If you are on government assistance, you can stretch your food money further by employing other money saving strategies. Clipping coupons, and employing well-known coupon strategies can help you get the most bang for your buck. Additionally, shopping the sales can help by providing you more for less. Plan your menus around sale circulars and coupons. Another option is to grow some of your own food. You can create a container garden, or, if you have the space, grow a garden in your backyard. This can help you get fresh produce for less. Combine these strategies with your food assistance, and more money will be free for use with other obligations. Find out more about different food assistance programs from the government at the USDA’s Food and Nutrition Service web site. Have you ever needed food assistance? Share your story in the comments. Does My Son Really Cost Me $26,000 a Year?